WinHost is a web hosting company that focuses on Windows (and Windows only) hosting. Although there may be many hosting companies on the internet that also provide Windows-only hosting, WinHost stands a head above all of them by making sure that you don’t have to pay a leg and arm to run your site. The good thing about having your site hosted on a Windows based server is that you will find it much easier to handle than if you were to work on, say, a Linux server. This is because, for the most part, the whole world uses Windows for their day-to-day computing activities. But WinHost makes it even easier to work on its servers by including a control panel that allows you to tweak and configure your site from a central place. You can use your WinHost control panel to do everything from changing your password to balancing your books and even making payments to your customers. If you want to make sure that your site looks and works perfectly on mobile devices you can use the goMobi link that is also on your control panel. Everything is so straight forward that anyone with the basics of computing can do amazing things with their websites. 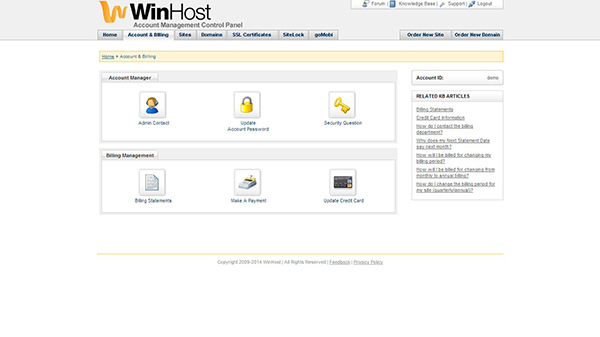 WinHost offers its clients an amazing array of free applications when you sign up with them. As a webmaster, you will not be hindered from realizing your dream website because you can’t run an application on your hosting plan or because you can’t afford to pay for it. Browsing through the list of applications, you can find something for almost any job. In the WinHost control panel, you can install applications like WordPress, Drupal, Joomla, phpMyAdmin and phpBB for open source apps and the likes of DotNetNuke, nopCommerce, BlogEngine and Orchard for .NET apps. Although WinHost runs Windows Server, you can still install PHP, one of the most popular open source scripting languages today. This is great news, and a relief for webmasters that used to face difficulties installing PHP on Windows servers. If you have programmed your website to access MySQL databases, you shouldn’t have any issues at WinHost because you can install them too. If you are running an intranet, say for your company or business, you will be glad to know that at WinHost you have the option of installing and using Kentico CMS. The list goes on. Whether you own a simple blog (you can install WordPress) or are the owner of an online store (nopCommerce can be used) you can install it all at the click of one button in your control panel. WinHost offers customer support all around the clock, every day. For those that aren’t customers yet, there is a forum where they can discuss issues and have any queries answered. Of course, paying customers can join in, too. 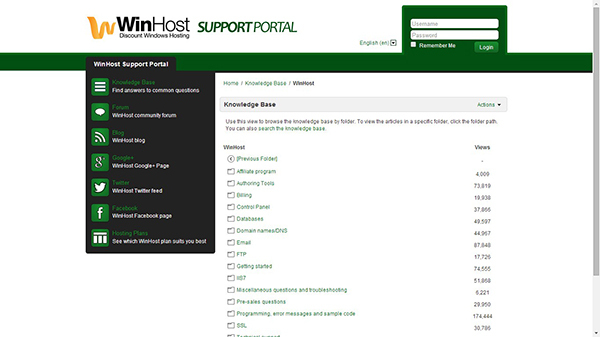 For its paying clients, WinHost offers a knowledgebase portal that covers every aspect of its hosting. If that doesn’t do it, the support team can be contacted on the Support Portal via the control panel. WinHost has three hosting plans. They are the WinHost Basic, WinHost Max and WinHost Ultimate. The prices for the plans are $3.95, $7.95 and $15.95 respectively. 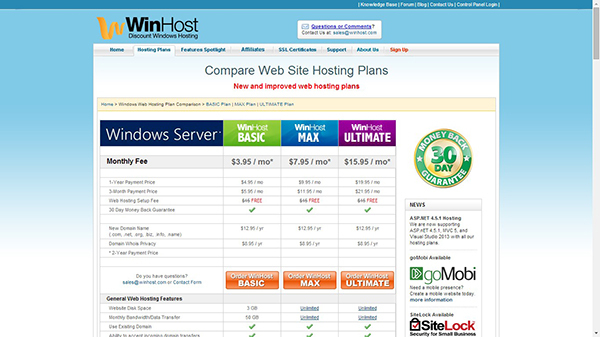 The amazing prices are offered only if you choose to sign up with WinHost for 2 years. Otherwise, you will have to pay a slightly higher price if your subscription time is shorter ($4.95, $9.95 and $19.95 if you pay for one year’s subscription). The disk space that is available for you is 3 GB with your WinHost Basic plan and unlimited for the other two plans. The bandwidth is 50 GB for WinHost Basic and again, unlimited for the other two plans. All hosting plans are on Windows Server and you get one SQL database with space for 500 MB of data in the WinHost Basic plan, unlimited number of SQL databases of 2 GB and 5 GB for the WinHost Max and WinHost Ultimate plans respectively.